The American Hiking Society celebrates National Trails Day on June 2nd. Their website offers resources and community events across the country. We all play a role in leaving our planet in better shape than we found it. In North Carolina, it’s no surprise to see several events planned. Here’s an interesting fact about the trails you hike: volunteers played a major role in creating the vast majority of them. 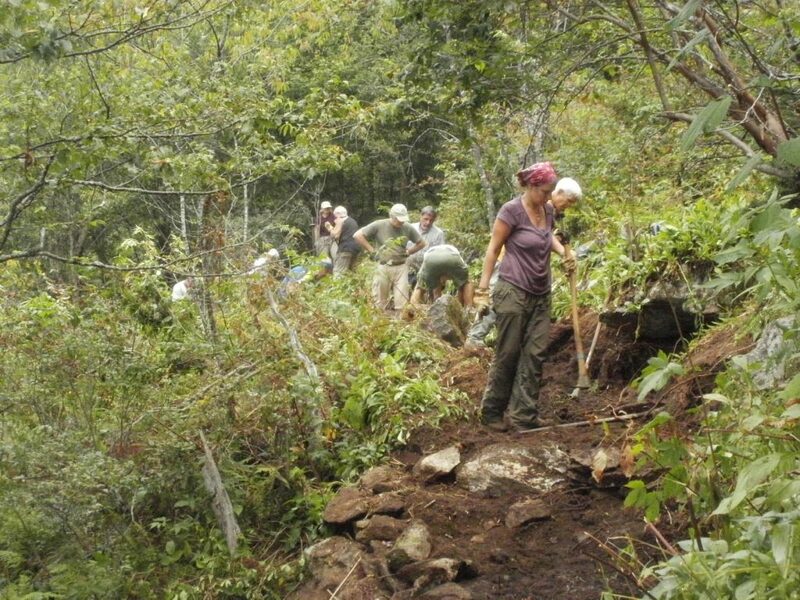 Volunteers work together to build NC trails. Take the statewide Mountains-to-Sea Trail. Of the 680 miles of trail that currently exists, volunteers had a hand in building roughly … 680 of those miles. (In 2017, volunteers put in 36,000 hours on the trail, according to Friends of the MST Outreach Manager Betsy Brown.) When the new trail is added at one of the state’s nature preserves, it may be surveyed and designed by a professional, but the heavy lifting (as well as sawing and raking and clearing) is usually done by volunteers. The Appalachian Trail, for instance, is maintained by 31 regional hiking clubs on its 2,190-mile run through 14 states. North Carolina clubs among those 31 are the Carolina Mountain Club, Nantahala Hiking Club, and the Piedmont Appalachian Trail Hikers. We love our trails: we must, in order to spend so much time tending to them. And since its creation 25 years ago, that’s been the rationale behind National Trails Day, a celebration the first June of every year for all things trail. Initially, the goal was to spend the day rolling up your sleeves and building, clearing, rerouting trail. It’s evolved into more of a celebration of trails: there’s still a lot of workday events, but now there are guided hikes, fairs, bike rides and more. In 2017, according to the American Hiking Society, which sponsors and runs the event, 122,000 people registered for 1,492 National Trails Day events. And this year, this coming Saturday, More than 900 National Trails Day events have been registered through AHS, including 34 in North Carolina. Hike in Asheboro at 9 a.m.
Six-mile hike that culminates with a climb to the top of Little Long Mountain, a cleared plateau that offers the best views of central North Carolina’s Uwharrie Mountains. Sponsor: City of Raleigh Parks & Rec. Get a first-hand look at how a trail is maintained: rakes, pitchforks, and wheelbarrows provided, you bring a water bottle, sturdy boots and clothes you don’t mind getting dirty. Hike in Winnabow (near Wilmington) at 9 a.m.
North Carolina’s land trusts play an often unsung role in protecting valuable natural areas and providing us with unique places to explore. This 2.5-mile hike lead by the NC Coastal Land Trust takes you through one of them. Bike ride in Greensboro at 9 a.m.
Take a 4.8-mile bike ride on the Downtown Greenway, enjoying live entertainment and food trucks on this family-friendly event. Hike, and bike ride in Glenville (near Cashiers) at 11 a.m.
There’s a picnic at Salt Rock Gap (one of the main entrances to Panthertown), followed by a hike. You can also learn more about mountain biking, fishing, rock climbing and more in the area. Kid-friendly hikes and more in Cramerton (Charlotte area) at 10 a.m.
One day, the work-in-progress Carolina Thread Trail hopes to have continuous trail linking 15 counties in the Charlotte area; this hike is on one of those segments, the 0.7-mile Goat Island Greenway and South Fork River Blueway (a paddle trail running 8.4 miles downstream; it is not part of the day’s adventure). In 2017, volunteers put in 36,000 hours on the trail, according to Friends of the MST Outreach Manager Betsy Brown.